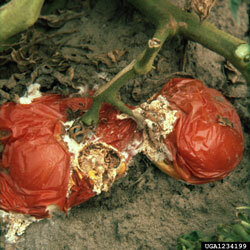 A common disease responsible for tomato rot is fusarium wilt. It causes yellowing of the leaves starting with the lowest leaves first and progressing up, and finally overall wilting of the plant. Fusarium crown and root rot is caused by the fungus Fusarium oxysporum radicis-lycopersici (FORL). 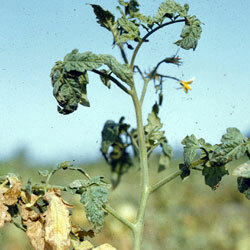 Infected plants may be stunted, and as they begin to bear fruit, their lower leaves turn yellow and wilt. Plants appear to recover at night after wilting during the warmest part of the day. Infected plants may either totally wilt and die, or survive in a weakened state, producing reduced quantities of inferior fruit. The fungus attacks both seedlings in the greenhouse and mature plants in the garden. In seedlings the disease causes stunting, yellowing, and premature loss of cotyledons (seed leaves). In advanced cases the fungus causes root rot, wilting, and seedling death. Plants either die or persist in a weakened state, producing inferior fruits. Fusarium oxysporum f.sp. radicis-lycopersici (FCRR) causes both crown and root rot. The disease is worsened by cool temperatures (10˚C to 20˚C/50˚F to 68˚F). Other factors that encourage the disease are soil with poor drainage, low soil pH, and ammoniacal nitrogen. Sterilize the soil and avoid use of wooden stakes, as the fungus can survive between seasons, or disinfect or use new stakes each season. Disinfect transplant trays by steaming before reusing. Add more organic matter to your soil for tomatoes before planting. Fumigate the soil before planting and immediately cover with a plastic mulch.